In the year of 1066, the future of Britain lay in the balance.Revered King Edward the Confessor died with no blood heir and an unclear succession.Immediately the lions pounced.The Norse King Harald Hardrada claimed the throne based on hislineage from earlier English King Canute.The Norman King William claimed the throne based onKing Edward's vows to make William his heir - afterall, Edward spoke no English and was more Norman than Saxon.The Saxon King Harold Godwinson claimed the thronebased on Edward's death bed confession,"I commend my wife to your care and with her my whole kingdom. "Who was correct? To this day scholars debate.In those days the claimants fought. Hardrada and the Norse invaded near York.Harold raced north from Wessex.The two met at Stamford Bridge.At this chokepoint Harold and the Anglo-Saxons repulsed the Norsecausing major casualties.It is said the Norse arrived in England with 500 ships and left with 20.But celebration was short.Word came that William was invading in the south. Immediately Harold raced south.Rather than wait in London or build a large army in a defensive position,Harold attacked near Hastings.William and the Normans formed up on the south side of the battle fieldin a long single line with knights in armor in the center,Breton infantry on the left, and the French infantry on the right.Harold and the Saxons took the hill on the north side in a long double line,armored fyrd in front and unarmored farmers, the Greater Fyrd, in back.Huscarls, the elite body guard of Harold, swung their two handed battle axesand protected their king. 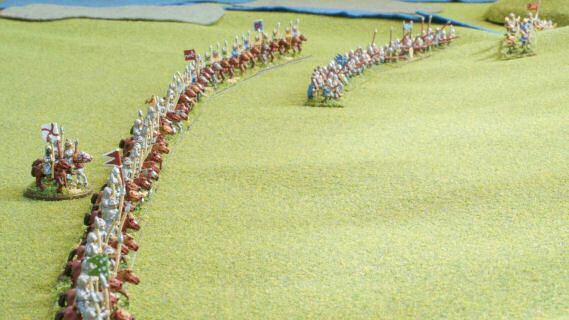 The photos of this article contain 10 mm miniatures forhistorical wargames battles.The units are painted and based according tothe miniature rules Warmaster Ancients.Armies are built from a list, in this case approximately 1000 points for each side.3 or 4 cavalry and 6 or 8 infantry are placed on a base.3 bases make up a unit.Leaders (on round bases) give orders and attempt to move the units around the battle field.When units are very close, they are more difficult to control and usually charge the nearestenemy.Close combat ensues. Casualties are given.Defeated units tend to panic.Victorious units tend to follow for more combat.In the end one side is victorious. In the case of the Battle of Hastings, the Normans won.The Saxons never recovered.Some locals submitted to the invaders. Other attempted to fight.The Normans built castles and brought all opposition to heel.In the end, most of England was subdued.The Normans brought both their language and their ways to England.An immense census of the country, the Domesday Book, was createdand all English inhabitants were now feudal subjects of the Normans. 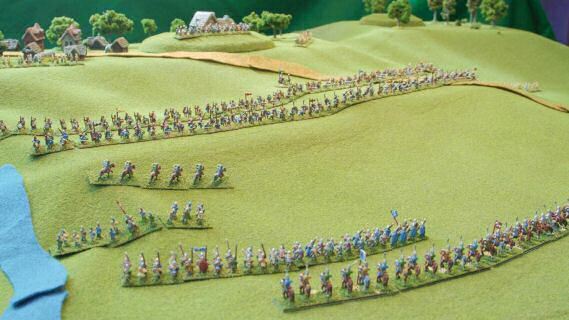 This photo shows the Norman left.To the bottom is the extreme left end of the Norman cavalry and their retainers.In front of this line are some Breton spear and bows.In the front are some mounted skirmishers.To the left of the photo lay some streams and the rougharea known as the Mal Fosse.This rough area caused the death of many combatants at the end of the battleas the evening sky concealed the treacherous ravines and rocky groundand the victims plunged over the edge to their demise. 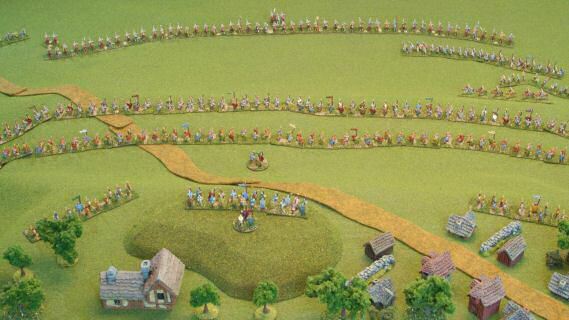 According to accounts the Saxon shield wall held and repulsed the Breton infantry.As the Bretons retreated, the Saxons broke ranks, chased the enemy downhill,and were cut down.The Normans seeing this baiting tactic work, repeated the tacticseveral times and depleted the effectiveness of the shield wall. Here we see the Norman right.The right end of the Norman cavalry ends and some crossbows and spearspick up the battle line.A road crosses the battle field from south east to north.It is conjectured that both sides hurriedly deployed to establish battle lines. Note that hobby stores sell felt cloth cheaply. For about $1, you can get patchesof felt to make roads, streams, woods, marsh, and whatever scenery you like.Of course three dimensional models are best, but felt is inexpensive and easyto play games with. To the extreme right we see William and his retinue.Did William lead from the front or the rear?You decide. In Warmaster rules, the leaders are based individually and may attach ordetach from fighting units.They may even lead while detached.As long as they keep making their leadership role (e.g. 2D6 <= 8 for most leaders),they can continue directing units.As is common, I base my leaders on round bases to distinguish them from the fighting units. Here is the Saxon view of the battle from above and to the north.Harold stands on the hill with his Huscarls to the bottom of the photo.The first long line up from Harold have the unarmored Greater Fyrd,the fighting peasants who were called up from the farms.In front of the Greater Fryd are the Select Fyrd. Theseare nobles and town leaders, typically with mail armor and shields.On either wings there are bows and skirmishers. 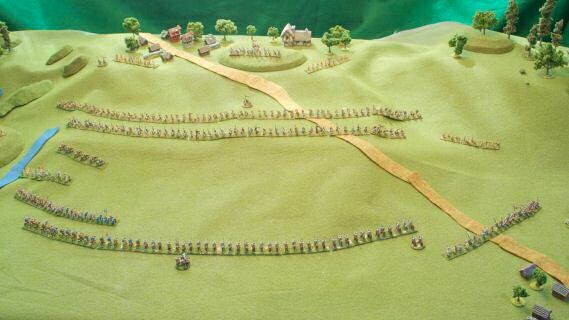 The village at the Saxon rear is somewhat hypothetical.It was likely built up after the battle.The hill is somewhat invisible from this vantage point. 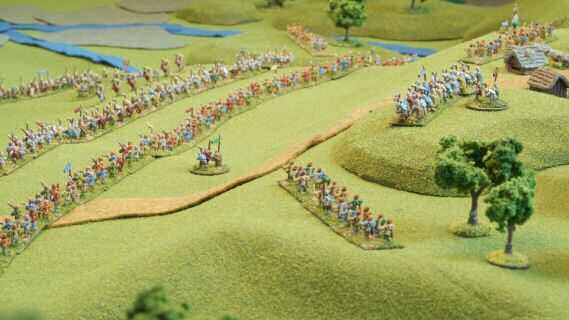 This photo shows the view from the Saxon left.A patch of woods marks this edge of the battle field.Some Saxon bows stand at the edge ready to rain arrows upon the Normans. 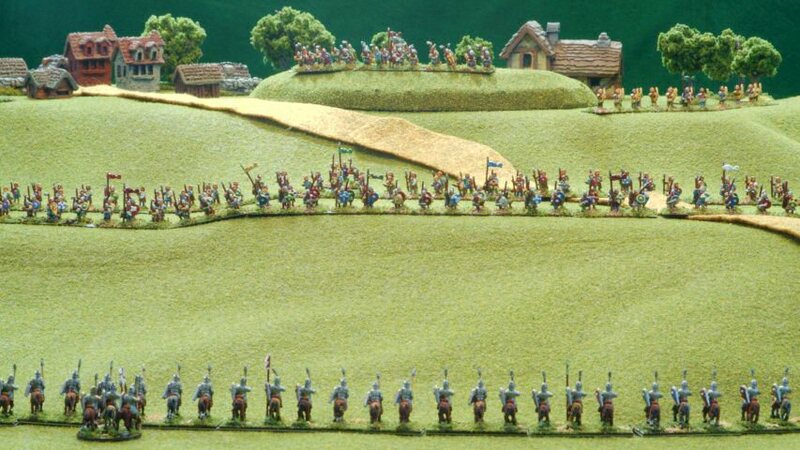 I modified the DBA and DBM basing for 15 mm figures.As with 15 mm, I placed 3 to 4 mounted units to base.However with infantry I doubled the typical 15 mm figure requirements:2 light infantry/psilois were doubled to 4,3 normal infantry were doubled to 6,and 4 heavy infantry were doubled to 8.Some people even put 10 or more on the heavy infantry bases. 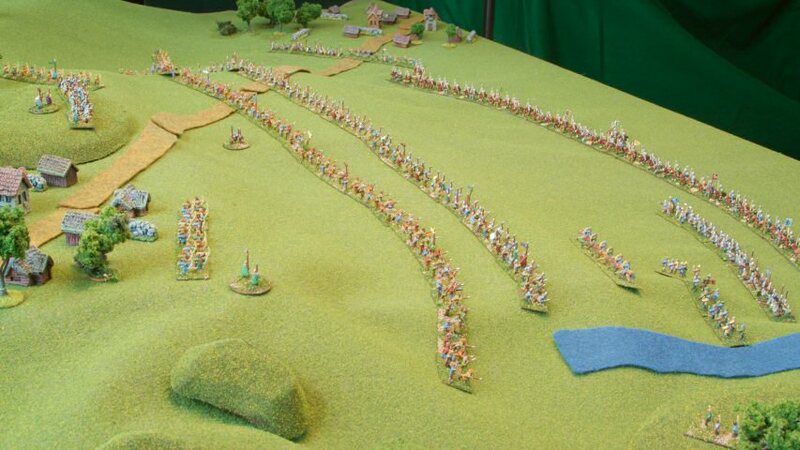 Here is a high view from the Saxon right.The Norman charge up the hill begins. 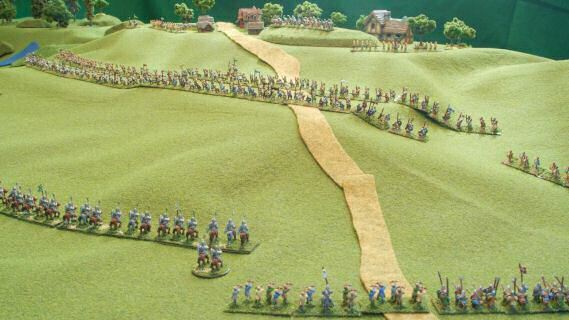 This view illustrates the value of smaller 10 mm figures.It is easier to field larger, more strategic level armieswith smaller figures.You can see that the figures look fine from this level.I found, however, that 10 mm figures did not save me much painting timefrom the 15 mm I usually do.I guess I am too detail-oriented, but if a figure had a belt,I had to paint it, if there was a scabbard, it was painted as well.The details of a 10 mm figure a somewhat more indistinct than15 mm figures, but they were still there, and hence they hadto be painted. 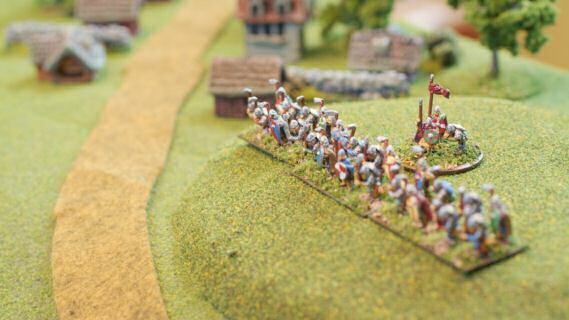 Finally, here is a close up of 10 mm Harold and his Huscarls on the hill.Huscarls are the elite, heavily armored body-guard units of the Saxons. The Warmaster army list for Saxons is a bit light on Huscarls.They limit the maximum to 1 unit (from memory - I don't have my rules as I write this).I think this limits the Saxon army too much.Many scholars think there were many Huscarls fighting for the Saxons.Yes, they were elite and expensive, but some argue thatwith the rush to battle, the elites comprised much of theSaxon fighting force.I don't mind the Huscarls being expensive, but I think thearmy list artificially limits the number appearing on the battle field. 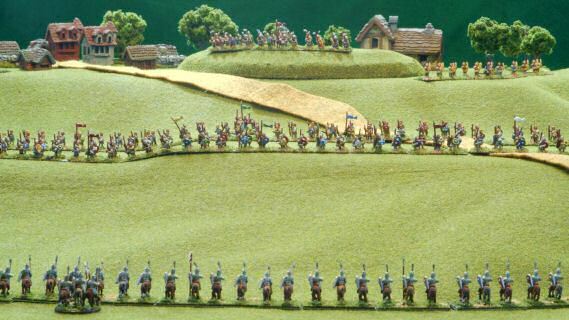 I hope you enjoyed reading the details of the Battle of Hastings in 10 mm,and the variables and thoughts that go into playing the battle withthe Warmaster rule set.More miniatures-related articles are atDan Becker's Miniatures and Models site.Thanks for stopping by and reading about my miniatures. Last modified: Thursday, 09-Jun-2011 12:54:48 MST.